MOSCOW --- The operation to recover the sunken floating dock PD-50 in Murmansk will be rather tricky and may take six months to one year to accomplish, a source in the defense-industrial complex has told TASS. "The enormous size and displacement of the floating dock as they are, the operation to recover it will be rather tricky. A great deal will depend on whether it lies flat or on the side. The moment it sank the floating dock developed a list, so most probably it is on the side, which will complicate the operation. The experience of recovering a sunken nuclear submarine (The Kursk) indicates, that the operation to recover the floating dock may take at least six months or last for a whole year," the source said. Apart from the PD-50 Russia has another floating dock, PD-1, of approximately identical parameters in Severodvinsk. 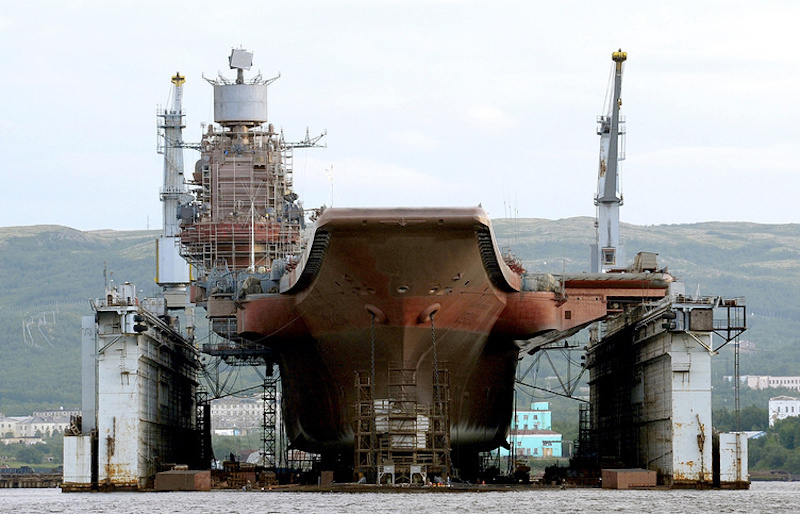 It is capable of accommodating large surface ships, such as The Admiral Kuznetsov or The Pyotr Veliki. The floating dock of the 82nd repair plant in Murmansk sank the moment The Admiral Kuznetsov was being pullout out. Four workers suffered hypothermia and were taken to hospital. One of them also had a stomach injury. One person went missing. The Defense Ministry concluded the repair contract with the ship repair plant Zvyozdochka in April 2018, hoping to have it back in 2021. The heavy aircraft carrying cruiser The Admiral Kuznertsov, project 11435, joined the Northern Fleet at the beginning of 1991. Its full displacement is 59,100 tonnes, and length, 306 meters. It is capable of developing a speed of 29 knots. The Admiral Kuznetsov is armed with up to 50 planes and helicopters and anti-ship and air defense missile systems and artillery pieces. The Admiral Kuznetsov is the Russian Navy’s largest ship and sole aircraft carrier.